Its model number and name are #006 / E. Honda. 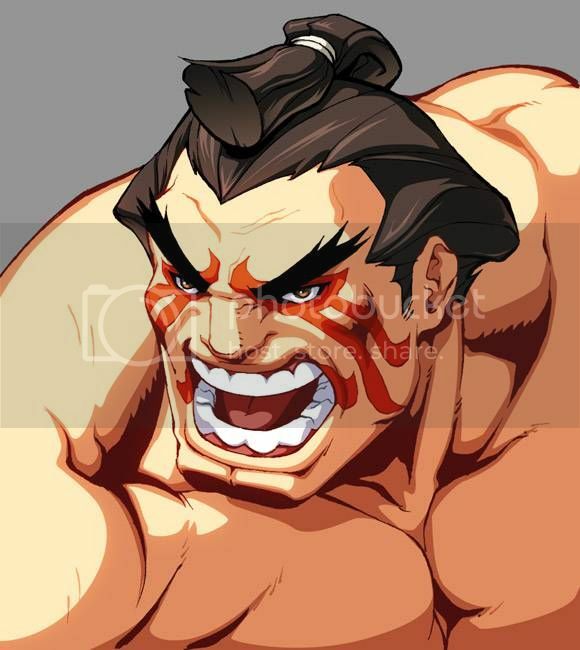 Character Bio - Edmond Honda began his training as a child, with a singular purpose of becoming the greatest sumo wrestler of all time. He became upset that the rest of the world did not view sumo wrestling with the same reverence as the Japanese did. 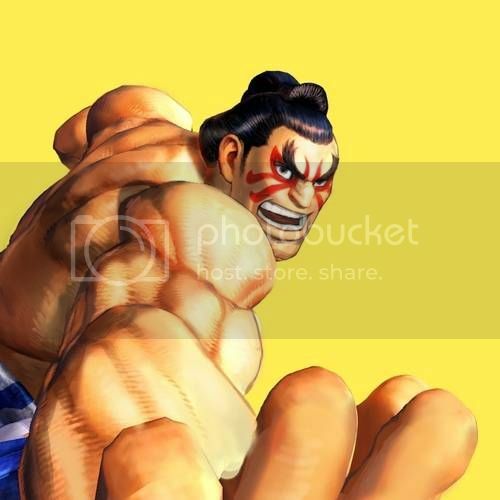 He entered into the second World Warrior tournament with the intention of showing everyone that sumo wrestlers are among the greatest fighters in the world. As a Human, E. Honda has these Human Synergies. As a Human, E. Honda interacts differently with certain special powers. Current Special Powers that Interact Differently with Humans. As a figure with a Special Attack, E. Honda interacts differently with certain special powers. Current Special Powers that Interact Differently with Special Attacks. After moving, if E. Honda is unengaged, instead of attacking, you may choose a non-adjacent figure within 3 spaces of E. Honda whose base is no more than 5 levels higher than his height or 5 levels lower than his base. Place E. Honda up to 2 spaces from where his movement ended and adjacent to the chosen figure. Roll the 20-sided die, adding 1 to the roll for each level E. Honda moved down this turn with this special power. If you roll 18 or higher, the chosen figure receives 2 wounds. Range 1. Attack 3 + Special. After using this special attack, if at least one skull was rolled, you may attack again with this special attack. You may continue attacking with this special attack until you fail to roll a skull. For each attack after the first, roll a number of attack dice equal to the number of skulls rolled for the previous attack. You may attack the same or a different figure with each subsequent attack. Last edited by johnny139; July 27th, 2016 at 02:32 PM. Last edited by SirGalahad; September 14th, 2014 at 07:27 PM. 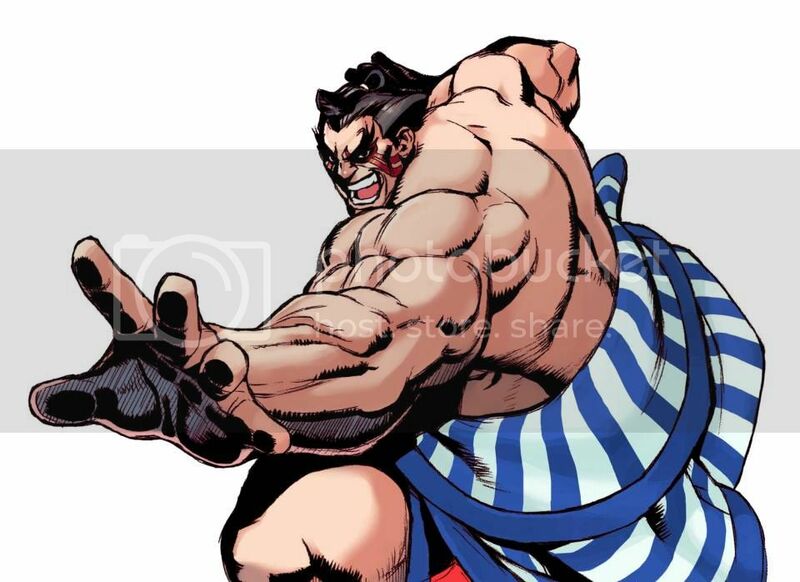 More Street Fighter characters are awesome. HERE is a higher quality version of the image you have in the first post; I think we should definitely prioritize that one, since it's part of the same series of comic covers as Ryu and I'm hoping we can sort of make a trend of using those. Honestly he's pretty much exactly what I would have hoped for. Flying Headbutt and Hundred Hand Slap are his two most iconic moves and you've got them down pat... the Slap in particular, can get crazy but usually won't, which is fun. Sort of tempted to add a knockback effect but I'm not sure if it's worth the hassle. Nitpicks, though: first, sumo is the sport, not the wrestler. We could go with "Sumo Wrestler" or just "Wrestler," which is what we have Zangief as. 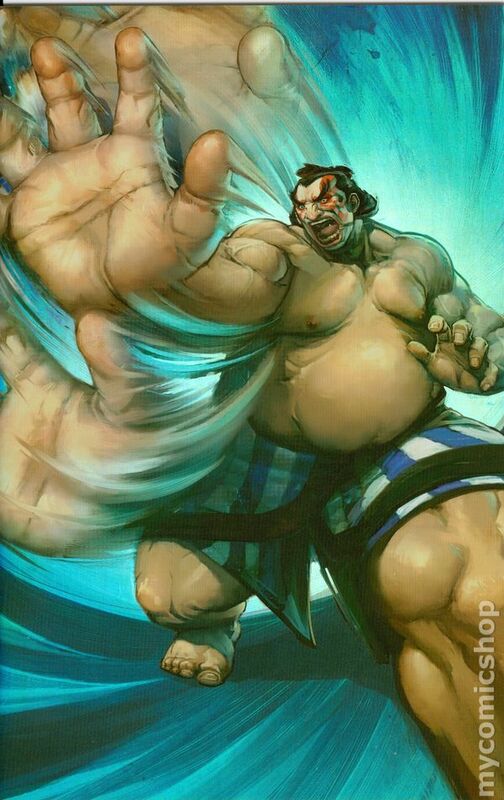 And, technically, the Flying Headbutt's official name is the "Sumo Headbutt," so we should probably go with that. If E. Honda is unengaged, instead of moving and attacking normally, you may choose a non-adjacent figure within 3 spaces of E. Honda whose base is no more than 5 levels higher than his height or 5 levels lower than his base. Place E. Honda adjacent to the chosen figure and roll the 20-sided die, adding 1 to the roll for each level E. Honda moved down this turn. If you roll 18 or higher, the chosen figure receives 2 wounds. So is it ok if he uses this against a figure that is exactly 3 spaces away you place him on the other side of the figure -- so 4 spaces through the figure, 5 around? If you don't mind that effect then I'm all good here . After using this special attack, you may attack again with this special attack, rolling X dice, where X is the number of skulls rolled in the previous attack. You may attack the same or a different figure with each subsequent attack. "Lightning Lad may attack one additional time, rolling a number of attack dice equal to the number of skulls rolled for the first attack." Do we want to keep consistency with these 2 powers (one way or the other, I don't mind if it means changing LL). After using this special attack, E. Honda may attack again with this special attack, rolling a number of attack dice equal to the number of skulls rolled for the previous attack. You may attack the same or a different figure with each subsequent attack. Fine with WRESTLER and SUMO HEADBUTT. Fine with adjusting to be consistent with Lightning Lad. The fewer X's, the better. After using this special attack, you may attack again with this special attack, rolling a number of attack dice equal to the number of skulls rolled in the previous attack. You may attack the same or a different figure with each subsequent attack. For the Headbutt, it doesn't make sense that it would take him to the other side of the figure, so an 'up to' will be needed. Thanks for catching that. If E. Honda is unengaged, instead of moving and attacking normally, you may choose a non-adjacent figure within 3 spaces of E. Honda whose base is no more than 5 levels higher than his height or 5 levels lower than his base. Place E. Honda up to 2 spaces from his original placement and adjacent to the chosen figure. Roll the 20-sided die, adding 1 to the roll for each level E. Honda moved down this turn. If you roll 18 or higher, the chosen figure receives 2 wounds. I like high risk high reward specials like this. It's why Heat Vision is on of my favorite special attacks. I don't see any issues with the design and I don't know much about Street Fighter so I can't comment on theme. Considering he's my favorite character, I wish the Hundred Hand Slap was more OP, but it looks fan-tastic! Glad to hear I'm doing something right after all the competitive issues with Aurora, Sage, and Jocasta. Maybe I should just avoid designing female figures. I've got Mastermind and Indigo-1 under my belt - not to mention all the others I didn't LD but did test. Competitive concerns are a group-problem that we all share responsibilities for. Part of it is adjusting our thinking to consider issues we just weren't considering previously. That said, let's see what the CRB guys say when the time comes before declaring this guy totally free of competitive issues. (Mind you, I don't see any right now). So is the hundred hand slap intended to attack continuously until you don't roll a skull (if so that isn't clear)? Or is it just one additional turn (which is what I assumed it was but your re-wording after I pointed out LL didn't change that part)?